The Fiat G.49 was an Italian two-seat basic trainer designed by Giuseppe Gabrielli and built by Fiat. The G.49 was designed as a replacement for the World War II-era US North American T-6 advanced trainer by Gabrielli and was first flown in September 1952. The G.49 was an all-metal low-wing cantilever monoplane with retracting tailwheel landing gear. 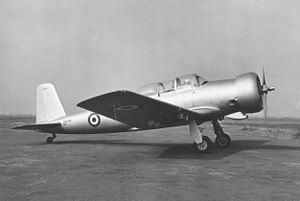 It had an enclosed cockpit with raised canopy for a pupil and instructor in tandem. Two variants were built with different engine installations; the G.49-1 with an Alvis Leonides radial engine and the G.49-2 with a Pratt & Whitney radial engine. The aircraft did not sell and only a small number were operated by the Aeronautica Militare. Variant powered by a 455 kW (610 hp) Pratt & Whitney R-1340 radial engine.